Finished size - 12" x 40"
Felted wool is just the perfect fabric to use on this fun applique project. 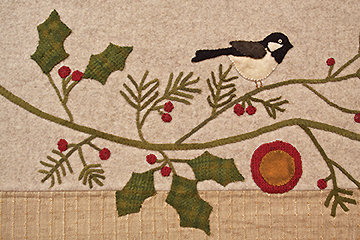 Chickdees, pine boughs and holly will cheer up your winter decorating. This would make a great pillow also, if you chose to finish it that way instead. This kit includes the printed pattern and all the fabric required to make the table runner.